My home state of Michigan* stands out. It really does, and I can prove it. But now, let’s get back to the facts. Miles above the earth, Michigan is one of only three American states you can identify from space (Alaska and Florida are the other two). Why so visible? Because they’re peninsulas! They’re land surrounded on three sides by water. 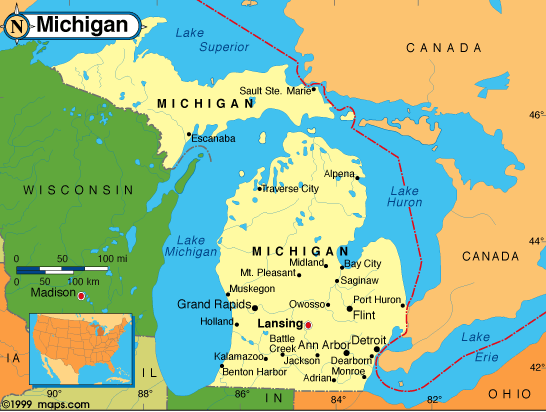 The great thing about Michigan is that it has not one, but two peninsulas. In fact, our state motto is Si quaeris peninsulam amoenam, circumspice. (States like to put their mottos in Latin; it makes them sound smarter.) This means: If you seek a pleasant peninsula, look about you. So, now you know two things: we’ve got shoreline, and we’re pleasant. The other great thing about our peninsulas is that they’re surrounded by fresh water. Alaska and Florida are surrounded by smelly salt water and sludge from oil spills. If you go swimming in one of Michigan’s four Great Lakes, you won’t get a mouthful of disgusting brine. Some Michiganders** claim you can drink the water straight from Lake Superior. To help their students remember the five Great Lakes, Michigan teachers use the acronym HOMES: Huron, Ontario, Michigan, Erie, Superior. Only Lake Ontario doesn’t border Michigan. Michigan flag includes our motto (at the bottom), water, a sunset (or sunrise), and some antlered animals (we do a lot of hunting). Residents from our east coast (from Alpena to Port Huron) will call it the “sunrise side” of the state. This was probably created by a marketing person who wanted to sell more property on Lake Huron. People on the Lake Michigan side call it the “sunset side” of the state. This is sexier because everyone likes to take romantic pictures of the sun going down on their vacation. A lot of rich Chicagoans buy property on the west coast of Michigan because it’s only a 2- or 3-hour drive to get away to their vacation homes. This makes property along Lake Michigan pricier. Whenever you meet Michiganders, they will show you where they’re from by pointing to a spot on their right palm. Just accept this. We say our state’s lower peninsula looks like a mitten. If you contort your left hand above your right hand, you can make a kind of scrunchy Upper Peninsula (or U.P.). Connecting the Upper and Lower Peninsulas is the world’s longest single-span suspension bridge, the Mackinac Bridge. It’s five beautiful miles to drive over, but if you’re afraid of heights, don’t look down! When Midland, MI (located mid-land in our state) got a pro baseball stadium, the owners had a contest to name the team. My wife suggested the Mid-Michigan Mitts (and even made elaborate sketches). This was really clever, we thought, because the state looks like a mitt and baseball players wear mitts—get it? In her drawings, a baseball in the mitt looked like a big white dot, representing Midland’s location. Her slogan was, “I’m smitten with the Mitten.” She didn’t win; the owners chose Loons instead, even though this wild bird doesn’t even live in central Michigan. Our state is so friendly, we want to give everyone a high five! International visitors to the U.S. like to visit the East and West Coasts because they’re famous. They visit the Gulf Coast for Mardi Gras or sunbathing. We like to refer to Michigan as America’s North Coast. Remember all that fresh water? Fact is, we’ve got more miles of coastline than any of the contiguous 48 states. That means fishing, waterskiing, sunset (or sunrise) watching, jet-skiing, swimming, snorkeling, beach strolling, and sailing for all water lovers. No place in Michigan is more than 85 miles from a Great Lake shoreline. People from the state’s U.P. (pronounced yoo-pee) are called Yoopers. They are very proud of living in an area of pristine forests and natural beauty and for a while wanted to secede from Michigan and create a state called Superior. Aside from hunting, fishing, and logging, there’s not a lot of industry there, so it wasn’t really a viable proposition. Still, Yoopers have their regional pride. They joke that everyone from the Lower Peninsula is a troll…because we all live below the Bridge. If you want to make a foreign day trip from Michigan, it’s a piece of cake. You can cross a bridge into Canada from Michigan’s U.P. into Sault Ste. Marie, Ontario. (It’s a French name; we pronounce Sault as “Soo.”) There’s a second bridge from Port Huron in the state’s Thumb region into Sarnia, and another one from Detroit into Windsor. If you prefer, you can drive to Canada over the Ambassador Bridge and return via the tunnel under the Detroit River. Entrants of the Detroit Marathon run both routes during the first half of the race, which offers the world’s only international underwater mile! 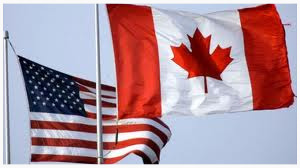 The U.S. stars & stripes and the Canadian maple leaf. A while ago, there was a controversy about Wisconsin, our neighbor across Lake Michigan. Wisconsinites claimed that their state also looked like a mitten. This was roundly pooh-poohed in Michigan. After all, Dorr County, the little nubbin of a peninsula that sticks out into Lake Michigan, looks more like a hangnail than an actual thumb. After Americans took an objective look at the map (see above), they largely agreed there is only one U.S. state that looks like a mitten. This book for children helps them learn their alphabet and interesting things about Michigan. It’s a great souvenir because it packs flat in your suitcase! For international visitors who want to make the most of their Michigan visit, here are my top dozen suggestions. Mackinac Island: (no motor vehicles allowed) My favorite place in all of Michigan! If you come visit Michigan’s west side, give me a call. I’ll give you a tour of Grand Rapids, our state’s second city. Then, maybe we’ll walk the beach of Lake Michigan at sunset. * By the way, don’t let someone tell you that folks from the Mitten State are called Michiganians. That attempt by Gov. Engler in the 1990s was made to sound fancy-schmancy. Real residents call themselves Michiganders. Vocabulary note: a “gander” is a male goose. ** A pronunciation note for my international friends: The “ch” in Michigan is pronounced like the middle of “machine” and not “macho.” It’s a French spelling of the Ojibwa word mishigamaa, which means “large water.” Here’s an earlier post on that topic.